Hello World Wide Web Stitchers! 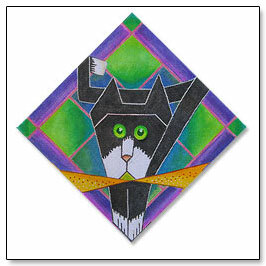 Origami started out (and is shown here) as a mini painting (about 3 x 3″) that I did several years ago during a short time of selling paintings on eBay. I cannot remember if he was sold, but I found the scan in my computer archives, so I decided to adapt his character to needlepoint canvas. 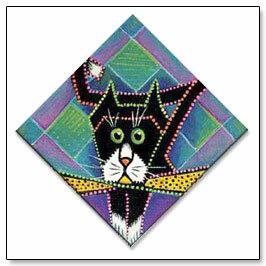 The new Origami the Cat is 8 x 8 inches square on 18 mesh canvas and is scheduled to be my personal painted canvas goal for 2009. I’ve painted a sample canvas to practice with the colors and check out how well the 18 mesh holds detail. The background is divided into a grid and is painted roughly, but good enough for using open stitch techniques. I plan to let the background paint play a role in bringing color effects to the finished piece. His black on black body parts are separated by a white line. This is just a visual separation and I will have to figure how I can achieve this with stitch changes, thread changes, and / or some overstitching. Today, I photographed the painted canvas and put Origami through some Photoshop gymnastics. A much loftier challenge emerged: A Four-Way Origami. I’ve calculated this would finish as a 16 x16 inch panel, so I need at least 20 x 20 inches of canvas – without any borders. To be safe, I think 24 x 24 inches of canvas would be better. That is HUGE for me; I rarely mount a canvas bigger than 18 inches in any direction. Since this is just an imaginary canvas, I need to get organized before I paint the real thing. It will be awhile before the next progress report. 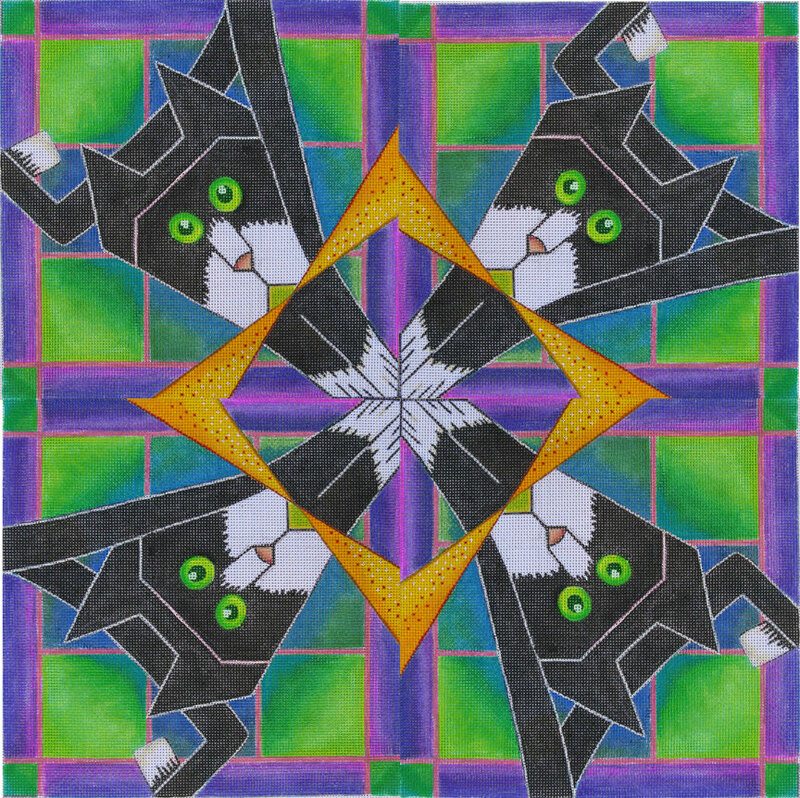 Origami the Cat has a character story. Read below. 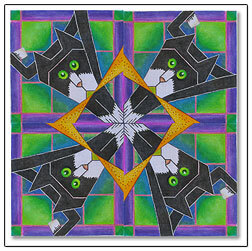 Origami is a playful tuxedo cat who spends all of his time outside. The coal black fur that covers his body functions as the ultimate solar collector. After a long lazy nap in the sun, Origami is fueled for some serious mischief and games that quench his thristy curiosity. As for his daily work, he is about like any other cat: sleep, eat, sleep, play, sleep, beg. He was not always called Origami. The tip of Orgami’s tail is white, so his original name is “Tippy”. A mishap, prompted the name change. Of the nine lives that Origami was issued, I’m not certain which one he is living now, but I am positive it is one less. The mishap is a mystery, and may or may not have cost have him a life, but with great certainty, I feel it scared one out of him. It resulted in three good days of cyclone kitty going into slow motion and some bruises to his vanity. I really doubt that Origami spent much time thinking about his rear appendage before the mishap. For most cats those thoughts vaporize sometime after kittenhood. But now, Origami is constantly reminded of the useless thing called a tail. Literally, the mishap proved to be a real drag. Poor Origami, now has a tail that drags behind him like a pestering shadow, and it bends in three places. Some days you can see on his face how frustrated and bemused he gets. He must be asking, “Why does this thing keep following me?” He performs the daily ritual grooming, and works hard to keep his, less than graceful accessory, in check. Of course, he has dreamy moments when he forgets his floppy foe, and naps quietly, peacefully, gently resting his chin on his snow white paws. Generally, I believe Origami is a happy cat today. He runs up trees, hides in tall grass, rolls in dirt patches, and has trained his provider to supply food on a regular basis. He may even be rekindling a friendship with his tail. The other day I watched while Origami was intensely spying a grasshopper. His back legs were stepping up and down, and the last tip of his tail wisking back and forth. It seemed like teamwork again.